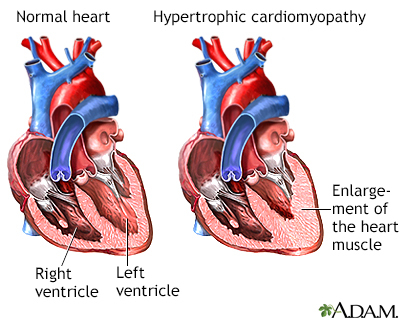 Hypertrophic cardiomyopathy (HCM) is a condition in which the heart muscle becomes thick. Often, only one part of the heart is thicker than the other parts. The thickening can make it harder for blood to leave the heart, forcing the heart to work harder to pump blood. It also can make it harder for the heart to relax and fill with blood. Hypertrophic cardiomyopathy is most often passed down through families (inherited). It is thought to result from defects in the genes that control heart muscle growth. Younger people are likely to have a more severe form of hypertrophic cardiomyopathy. However, the condition is seen in people of all ages. Some people with the condition may have no symptoms. They may first find out they have the problem during a routine medical exam. In many young adults, the first symptom of hypertrophic cardiomyopathy is sudden collapse and possible death. This can be caused by highly abnormal heart rhythms (arrhythmias). It may also be due to a blockage that prevents the outflow of blood from the heart to the rest of the body. Abnormal heart sounds or a heart murmur. These sounds may change with different body positions. The pulse in your arms and neck will also be checked. The provider may feel an abnormal heartbeat in the chest. Blood tests may be done to rule out other diseases. Close family members of people who have been diagnosed with hypertrophic cardiomyopathy may be screened for the condition. Always follow your provider's advice about exercise if you have hypertrophic cardiomyopathy. You may be told to avoid strenuous exercise. Also, see your provider for regularly scheduled checkups. If you have symptoms, you may need medicines such as beta-blockers and calcium channel blockers to help the heart contract and relax correctly. These drugs may relieve chest pain or shortness of breath when exercising. Medicines to treat the abnormal rhythm. Blood thinners to reduce the risk of blood clots (if the arrhythmia is due to atrial fibrillation). A permanent pacemaker to control the heartbeat. An implanted defibrillator that recognizes life-threatening heart rhythms and sends an electrical pulse to stop them. Sometimes a defibrillator is placed, even if the patient has not had an arrhythmia but is at high risk for a deadly arrhythmia (for example, if the heart muscle is very thick or weak, or the patient has a relative who has died suddenly). When blood flow out of the heart is severely blocked, symptoms can become severe. An operation called surgical myectomy may be done. In some cases, people may be given an injection of alcohol into the arteries that feed the thickened part of the heart (alcohol septal ablation). People who have this procedure often show much improvement. You may need surgery to repair the heart's mitral valve if it is leaking. Some people with hypertrophic cardiomyopathy may not have symptoms and will have normal lifespan. Others may get worse slowly or quickly. In some cases, the condition may develop into dilated cardiomyopathy. People with hypertrophic cardiomyopathy are at higher risk for sudden death than people without the condition. Sudden death can occur at a young age. There are different types of hypertrophic cardiomyopathy, which have different prognoses. The outlook may be better when the disease occurs in older people or when there is a particular pattern of thickness in the heart muscle. Hypertrophic cardiomyopathy is a well-known cause of sudden death in athletes. Almost half of deaths due to this condition happen during or just after some type of physical activity. You have any symptoms of hypertrophic cardiomyopathy. You develop chest pain, palpitations, faintness, or other new or unexplained symptoms. Maron BJ, Maron MS, Olivotto I. Hypertrophic cardiomyopathy. In: Zipes DP, Libby P, Bonow RO, Mann DL, Tomaselli GF, Braunwald E, eds. Braunwald's Heart Disease: A Textbook of Cardiovascular Medicine. 11th ed. Philadelphia, PA: Elsevier Saunders; 2018:chap 78. McKenna WJ, Elliott P. Diseases of the myocardium and endocardium. In: Goldman L, Schafer AI, eds. Goldman-Cecil Medicine. 25th ed. Philadelphia, PA: Elsevier Saunders; 2016:chap 60.